Select seats are available for North Carolina Symphony Education Concerts at Meymandi Concert Hall in Raleigh (Wake County) on May 7, May 8, and May 9. Contact education@ncsymphony.org for more information. Education Concerts in other North Carolina counties are arranged directly through school districts. 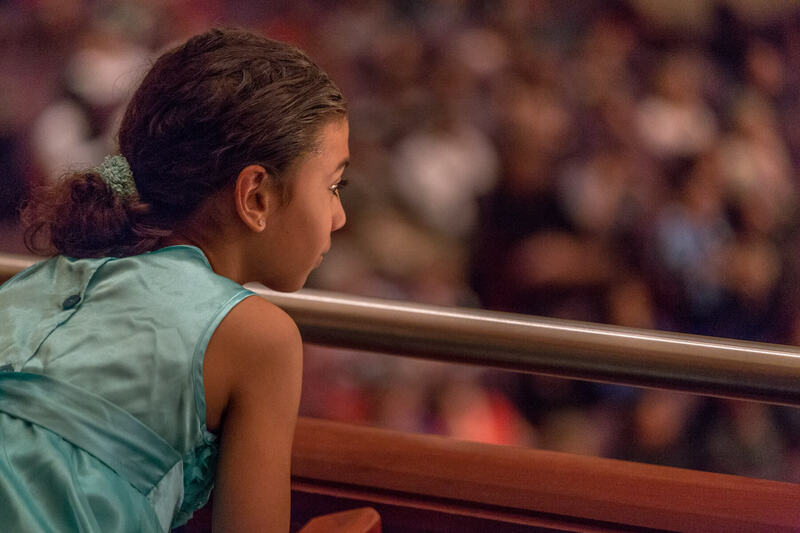 Each year, more than 50,000 fourth and fifth graders have their first live orchestral music experience at the North Carolina Symphony’s Education Concerts. Our interactive performances take place at concert halls and school auditoriums throughout the state, including under-served communities where students would otherwise have little or no access to the arts. The Education Concert theme, “What Makes Music … Music?” teaches core musical components such as melody, rhythm, and dynamics. Aligning with the curriculum set by the North Carolina Department of Public Instruction, we work with music educators to develop annual teacher curriculum guides and accompanying student workbooks to be used in classroom activities throughout the year in preparation for the Education Concert. After seven decades, nearly everyone who grew up in the state of North Carolina shares the common thread of having experienced the magic of the Symphony as a child. We remain firmly committed to that tradition, collaborating with 26 public school systems and presenting our 40 Education Concerts free of charge every year. Teachers who participate in the Symphony’s annual Teacher Workshop receive a free copy of the teacher guide, student workbook, and accompanying CD. (Please find information about the Teacher Workshop below.) Additional copies of classroom materials are available for purchase. Every August, the North Carolina Symphony kicks off the school year by hosting a five-hour Teacher Workshop for educators who will be preparing students to attend our Education Concerts. Attendees have early access to education materials for the year, and fellow teachers, NCS staff, and musicians demonstrate suggested classroom activities and techniques. The Teacher Workshop provides participants with a Certificate of Participation for five hours, which can be used for CEU credit with prior approval from the school system. Music educators with students attending the NCS Education Concert are strongly encouraged to attend. Through the Ensembles in the Schools program, the North Carolina Symphony sends a wind quintet and string quartet into school classrooms for intimate learning experiences. The ensembles, comprised of North Carolina Symphony musicians, give an interactive performance that reinforces the fundamentals of music and demonstrates the teamwork involved in music making. The NCS education staff and musicians work collaboratively with classroom teachers to create a program that is entertaining and supports North Carolina curriculum guidelines. Ensembles in the Schools can be adapted for any grade level K-6 and the program is available for booking throughout the state of North Carolina. Curriculum guides and student workbooks, which can be used to prepare students for their in-classroom performance, are supplied to teachers at no additional cost. Children can try out the instruments of the orchestra for themselves at our popular Instrument Zoo! Make music on our string, woodwind, brass, and percussion instruments before Young People’s Concerts, most Summerfest concerts, and at special Music Makers events at Marbles Kids Museum. For more information about any of these programs, please contact the Education department at education@ncsymphony.org.